I’ll admit that when it comes to my reading, occasionally I focus on quantity rather than quality. In 2012 I read 93 books, which was, in hindsight, far too many. What was the name of the protagonist in The Lighthouse by Alison Moore? I haven’t a clue. 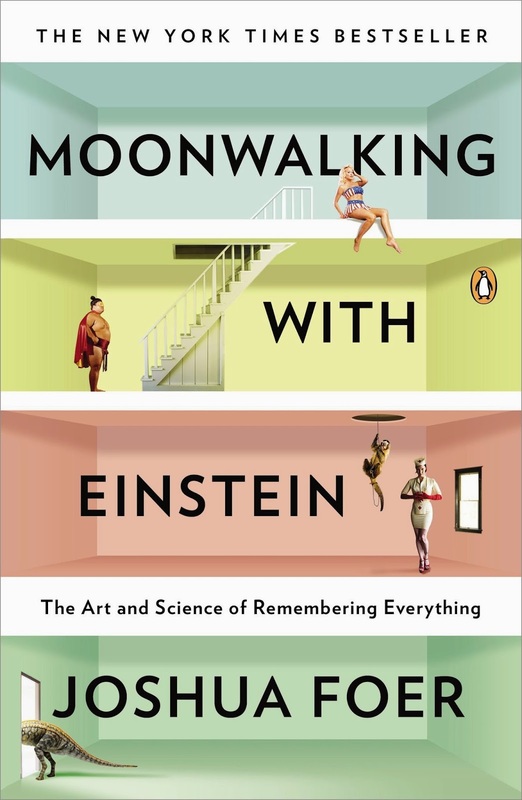 It was by reading Moonwalking with Einstein by Joshua Foer, a superb book on memory, that I started properly thinking about this. How many books do I know really well? One Hundred Years of Solitude: I remember magical realism and that I enjoyed it. But that’s about it. I don’t even reacall when I read it. About Wuthering Heights I remember exactly two things: that I read it in a high school English class and that there was a character named Heathcliff. I couldn’t say whether I liked the book or not. To counter the mindless binging of books, I think we need to not “read and read and read”, but simply read. It’s something I’ve become a lot better at remembering, but I know my manic reading tendencies will return (and probably soon). Last year I ticked off a modest 59 books, and this year I’ve so far managed a meagre 34. I’m happy with that. I’d like to say that I’ve really mulled over The Secret History by Donna Tartt in all its intellectual, vicious glory, and enjoyed every mindful minute of Robert Galbraith’s The Silkworm. And I definitely remember that the protagonist of The Goldfinch was called Theo, and that there were two other wonderful characters called Hobie and Pippa. By not pushing ourselves to read great lists of Booker Prize winners in a single summer, we can perhaps read more into our books. To compensate a little for the treachery and weakness of my memory, so extreme that it has happened to me more than once to pick up again, as recent and unknown to me, books which I had read carefully a few years before and scribbled over with my notes, I have adopted the habit for some time now of adding at the end of each book (I mean of those that I intend to use only once) the time I finished reading it and the judgement I have derived of it as a whole, so that this may represent to me at least the sense and general idea I had conceived of the author in reading it. 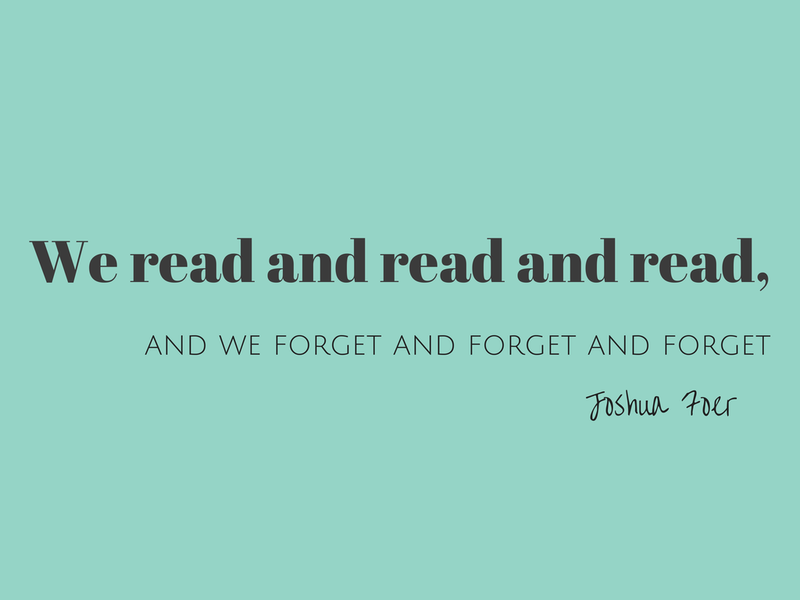 How do you try to remember the books you read? Do you annotate them and use lots of post-its (as I do), or do you keep a reading journal? Do you read archeologically around an author or topic? Or do you set aside time to reread your favourite novels? "A lot" – that is my answer to your title question. Writing about books is an enormous help. But it is also an issue of experience and in some sense training. Have you read about the Renaissance concept of the memory palace? People would create elaborate mental filing systems in order to retain a huge amount of information. I can't really do that myself, but books often serve as substitutes. The author creates a big pattern in which I can store the book. This may well make no sense! I do reread a lot, too. I reread while reading, going back over passages that I did not read so well at first. I used to read fast and to some extent had the issues that you allude to. I even read some books when I was younger that I now do not count as having read because I read them so frivolously. I read very slowly and carefully these days and I am happy to say I get a lot out of books and I remember them well. As Tom mentions, writing about books helps a lot. Writing about what you read definitely helps to cement key details I find, but I can't say I enjoy reading slowly though, neither do I rush seeing no point in speed-reading novels being read for enjoyment (although some books are just made to be devoured in one sitting which is slightly different – and they're the kind you usually don't need to remember much about!). Thank you for the brilliant comment, Tom! I'm so glad that you mentioned the memory palace concept – I'm fascinated by it! I've applied it to my university work and learning facts and speeches before, but I've never really used it properly when it comes to storing my reading…this is something I must work on! I do know that by reading around an author/book as much as possible- and making as many connections and links with existing knowledge as I can – I have much more chance of later recall. I think this is also what I aim to achieve by writing and blogging! That's also a good process you've got to reread and clarify passages before moving onto the next book. Thank you, Brian! I can definitely tell that you're a thoughtful reader from your reviews – they're always so well-considered and connected brilliantly to other books and pieces of knowledge! I think there's much to be said for returning to the habit of the ancients in truly committing a book to heart and applying it to our own lives and predicaments. Yes! Finding a balance is key I think. Some novels I've sped through and absolutely loved, and while I don't remember all the details I recall enjoying the experience and feeling totally immersed 😉 Different books certainly call for different approaches – you're totally right. I think I'd do well to follow my inner reading instinct! Thank you for the great comment, Annabel! Every book is different and each I read differently. For example I found two books which had so profound impact on my way of thinking, that I'm reading them always. Both of them I read at least dozen times, both of them I read a few sentences each day. I read books written by saints and I write down the quotes from them and often my thoughts about those quotes. When I read self-help books I try to find a few nuggets and apply them. When I read novels I usualy read them fast and furious. And I found that writing a review about book helps quite a lot with the level of retention. Michal, it's great that you've mentioned that every book is different! That is such a good way to approach reading. I read in a very similar way – with some books I cover them with post it notes, copy down quotes, and mull them over for a good time. Other books I binge-read and finish in a day or two! Others I apply to my life (with varying degrees of success). And the truth is, I don't really need to remember everything about some of the books I read. Your comment summarises it perfectly!